Almost every great idea is born from a necessity and who doesn’t need a cellphone charger that works everywhere without a plug? The idea of a charger that works only with a candle was incredible. A device that can charge your mobile phone using the heat produced by a candle has been developed to help keep people connected during blackouts. The Candle Charger uses a thermoelectric generator to convert the heat from a naked flame into around 2.5 Watts of energy. Be ready for power outages. Instant, reliable, indoor USB power using just a candle and water - stay charged and connected. 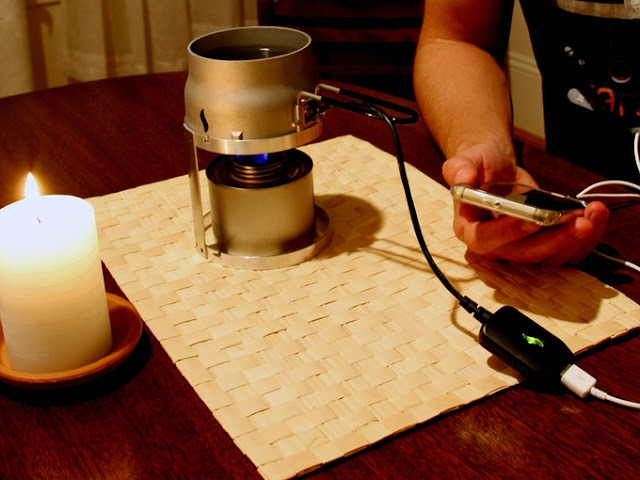 The Candle Charger by Stower is the first indoor power plant for smartphones. Candle + water = essential USB power for your home during grid outages and blackouts. A thermoelectric module, also known as a Peltier cooler. Thermoelectric modules are semiconductor devices that convert temperature gradients – one side hot, one side cold – into electricity. The Candle Charger uses nontoxic bismuth telluride-based modules, which have been in mass production for over twenty years for scientific, refrigeration, and automotive industries. The Stower smart circuit that conditions the power coming from the module to match power requirements of the device being charged (e.g. a smartphone). To increase cost savings and overall efficiency, Stower directly charges your electronic devices rather than charge an intermediate battery. Thanks to the circuitry developed exclusively for Stower products that continually monitors the power output from the thermoelectric generator, boosts the voltage to USB standard 5V, conditions the power from the generator so it matches internal charging requirements of smartphones, switching between “bands” of acceptable current levels and gradually dropping the voltage so phones don’t drop the charge. Support & contribute for this incredible product at Kickstarter.